The Asian Poker Tour is a popular tour that started back in 2008 and over the years it has staged over 80 events along with hundreds of small tournaments in the Asian region. The various events that have been played have generated more than $30 Million in prize money and the tour has seen some of the top winnings in the poker world. With great results and some of t eh best poker players from around the world. The Asian Poker Tour remains one of the top tours for professional players and with satellite events that can lead to seats at major events, this tour continues to attract poker players from all around the globe. As with all major poker events, there are strict rules that are in place for all players. The Asian Poker Tour is one of the fastest growing tours in the world and it has attracted professional players from all around the world, all competing for guaranteed prize pool payouts and prestigious titles. All Asian Poker Tour players who register will be required to present a valid ID when they register to ensure they are of legal gambling age and that their identity is true. APT visitors can find more information on our frequently asked questions page, where a variety of topics are featured. During tour events, the Poker Tournament Directors Association's Rules will be in play as well as some additional rules, so players need to be aware of these before they start engaging in any poker action on the tour. There is a no smoking rule in all tournament areas and those that violate this rule will receive a one round penalty. There are also late registration rules and those that are seated at a satellite or tournament event after it starts will receive a full stack and will be immediately dealt in. The main event registration will come to a close when round 10 starts and satellites will all close by the end of the first break. All other registration for events will close at the beginning of round 7. There are also Redraw rules, Hand for Hand Play regulations, re-entry policies, rules pertaining to seats won through satellite play and rules for Deal Making and Deal Facilitation. The complete rules are listed at the Asian Poker Tournament home page and here, players can find all the information they need to become familiar with events, how they are played and how to get started with one of the hottest poker tours in the world. 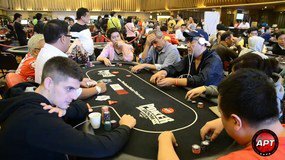 All players engaging in Asian Poker Tour action will have to adhere to all rules. This year, there are some amazing events where Asian Poker Tour players can compete for stunning winnings. 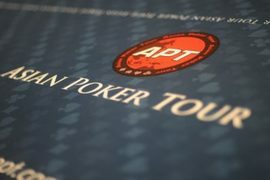 Two major tour events have already been completed with posted results and these were the APT Kickoff Vietnam and the APT Philippines Championships. The Vietnam winner was Adrian Esslen from Germany and the Main Event in the Philippines was won by Lester Edoc. Upcoming events will yield some great results and will surely generate massive winnings for Asian Poker Tour players who enter the events. The APT Macau Championships were held in May, though the results have not been posted at the site. Upcoming events include the Korea Seoul. Vietnam Championships, Korea Championships, Philippines Championships II, Vietnam Da Nang Championships and the Finale Macau Championships. The Asian Poker Tour offers the POS, or Player of the Series award, which is a loyalty award presented to players who have shown exemplary performance during a full series. This was first offered in 2017 and in 2018, cash prizes have been added. First place Asian Poker Tour players will receive a Luxury Watch, Custom Ring, Trophy and $800 in cash Second and third place winners will grab a trophy and $100 in cash. With these added rewards, players who enter events in the Asian Poker Tour will have even more ways to enjoy being winners and will find that being named the Player of the Series is a title that is quite prestigious and respected. Some of the leading online casinos in the industry and top rated poker rooms will host satellite events where players can earn entries and seats at the Asian Poker Tour events. Satellite events will have a small buy-in amount and players will compete with each other while playing Texas Hold'em for their chance to win a seat at the main event. Some of the best online poker rooms in the industry will offer APT satellite tournaments and this is a great way for online players to engage in thrilling poker action, play with the pros and have their chance at being the next player in the Asian Poker Tour, one of the hottest poker tours worldwide.